1st Place: Vivian Xiao, Adeline Yu and Sarah Thomas – Roberto Clemente Middle School, MD for Quiescent App for people to manage their stress. 2nd Place: Anika Gupta, Leila Plunkett and Radha Vinayak – Luther Jackson Middle School, VA for an App RePurpose that improves waste management by connecting the community. 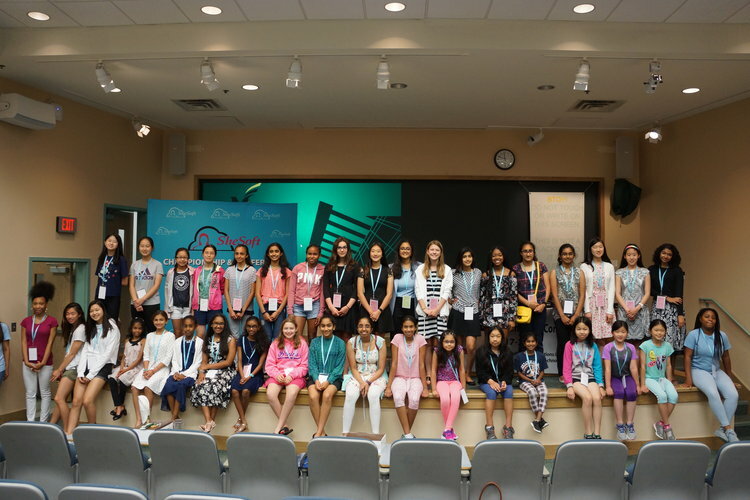 3rd Place (Tie): Nikki Pillai - Longfellow Middle School, VA for an App, called “CP Text” that helps kids with cerebral palsy communicate; Sneha Kalyan – Rocky Run Middle School VA for a barcode scanner App for medicines. Honorable Mentions: Anvi Kalyana - Nysmith School for the Gifted, VA for project on modelling the relationship between antibodies and antigens. ; Myara Barnes – DC Charter School for her app that helps other girls succeed in life ; Samantha Matthews – DC Charter School for her App that helps girls to succeed in life by information. 1st Place: Vishana Baskaran – Mercer Middle School, VA for Project Knobesity App on intensive research and app development on obesity. 2nd Place: Hillary Yoon, Kristine Nysmith and Madeline Magielnicki – Nysmith School for the Gifted, VA for their website project Trifind, which helps create learning opportunities for all needs. 3rd Place (Tie): Sahar Yousif – Laurel Ridge Elementary School, VA for project building website that helps educate girls and the general public about robotics and engineering; Natalie Pillai – Haycock Elementary School, VA for her App for Autistic Music Therapy using music playback to improve the Autism lifestyle. Honorable Mentions: Saunté Snowden – DC Charter School for her project on building website for baby sitter needs for the parents; Eesha Somasundar, Nysmith School for gifted, VA for project Eco Cardboard Wool Pots (ECWP) which is made out of recycled materials like coffee cups, socks, hats and gloves and the App ECWP program stores data from the user of their plant’s growth and outputs data about plant growth; Teresa Matthews – DC Charter School for her project on building an App that helps football players know the players and their background in a game.